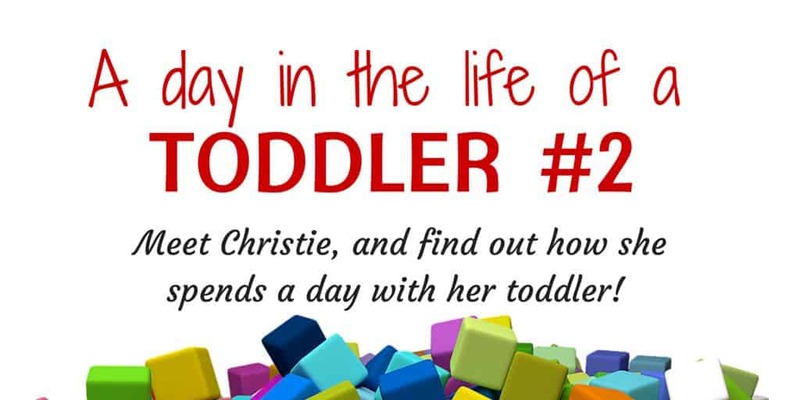 I’m so excited to launch the first in our ‘A Day in the Life of a Toddler’ series. They say it takes a village to raise a child, but the reality is that modern day parenting can often mean a lot of time alone with you and your toddler. The prevalence of social media means we generally only see the ‘best bits’ of others parenting lives and rarely get an insight into a true day of a mother, father or carer of a toddler. I know I always wonder what other parents do with their toddlers all day, and it turns out that other parents would love to know this too. This series is designed to provide inspiration, a sense of community, and the realisation that we are not all ‘Pinterest Perfect’ parents! 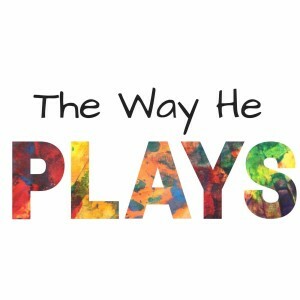 This week we get to meet the lovely Alison from The Way He Plays, who shares a day in the life of her 20 month old son. Alison joins us from Australia. If you would like to be part of this series please contact us. At the moment I’m 7 months pregnant with my second and a full-time stay at home mum to my 20-month-old boy (who I’m currently toilet training, just to make life more exhausting for myself!). My husband works as a Director in an Out of School Hours Care at a nearby school and works a split shift each day. Our days vary quite a lot; some days are busy while others are very quiet. Today I’ve decided to share with you a typical Tuesday in our life! 4:00am – My boy wakes up and I sit with him to settle him back to sleep. 8:00am – We get up and snuggle on the couch while watching Peter Rabbit. 8:15am – I sit him on the potty then get him dressed and we have breakfast together. 8:45am – He mainly plays with my fit ball while I get ready, he loves rolling the ball around the house and banging his hands on it. 9:15am – He uses the potty again and then we leave for Playgroup. 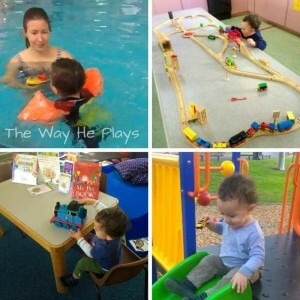 9:30 – 11am – At playgroup he enjoys playing with ride on cars, balls, painting and drawing. We have fruit with the other children and enjoy some songs before going home. I take our potty with us to use in the toilets while we are there. 11:30am – We have lunch at home with my husband and then my boy uses the potty and plays for a while before his nap. It’s a mix of independent play and us playing together while my husband and I potter around the house doing some tidying and cleaning. 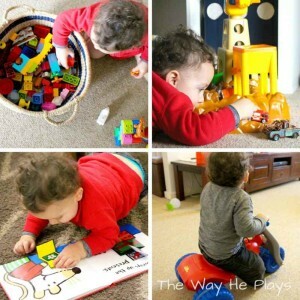 He plays with his Duplo, pushes his cars around, looks at a flap book (his favourite kind of book at the moment) and rides his trike in this period. 12:30pm – After putting a nappy on him we read a book together in the rocking chair in his room. He falls asleep in my arms so I transfer him to his toddler bed. 12:45pm – ‘Me Time’ I have lunch, watch a TV show and have a shower. 2:10pm – My boy wakes up and walks into the lounge room to find us, we have a snuggle and read a few more books together. He then plays cars with his Dad while I get the pram ready for a walk. 2:45pm – My husband goes back to work and after my boy uses the potty we go for a walk. This walk is for my benefit so he is in the pram the whole time. I take toys and snacks with me to keep him happy. 3:30pm – Home from our walk and we stay outside for a play. 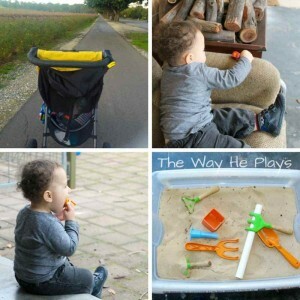 He mainly plays in his sandpit which is actually a small handmade sensory table, but also just wanders and explores the yard. 4:00pm – We go inside to have a snack and use the potty. 4:10pm – I turn our couch into a ramp, put some Wiggles music on and let him play independently whilst I cook dinner. This does include him coming in and out of the kitchen for cuddles and bringing me toys to put back together but he is generally occupied during this time. 4:40pm – Dinner is prepped and cooking and I potter around the house doing a few more jobs. He has moved to his room and is playing with my old wallet and cards, he likes to slide the cards in and out and loves the ID cards with my photo on them. 4:55pm – He is back in our family room playing with a toy house and his cars. 5:00pm – I take him to the potty. 5:10pm – At this point Rodri starts to get grumpy and whining at my feet so I know he needs my attention to avoid a meltdown. I quickly walk around the house collecting lots of things that twist open. He is just starting to manage to open these types of containers and I know it keeps him focused so we sit down and play with them together. After having my attention for a while he happily moves back to independent play. I find that sometimes he needs me for just 5 minutes or so and then when he chooses independent play I can go back to my jobs. 5:30pm – He asks for the potty this time, a small win! 5:40pm – He draws a circle on his palm with his finger which is his way of telling me that he wants to watch In The Night Garden. I put it on and he sits and watches it (the only show that happens to keep him still). I use this time to tidy up his toys and the lounge. 6:00pm – We eat dinner together. 6:30pm – My husband gets home from work and the boys play together, this is mainly rough and tumble play with lots of tickles and giggling. I run the bath and get his pyjamas ready. 6:50pm – Bath time. He mainly plays with his stacking cups but also has rubber ducks, plastic boats and he likes to take a couple of cars in with him too. 7:10pm – Time for pyjamas and a book. 7:25pm – We leave him in his cot awake, he complains a little but doesn’t get too worked up tonight and eventually settles himself to sleep, Yay! Bush Playgroup once a fortnight alternating with a craft based Playgroup every other week. Visiting friend’s houses or having them visit us. Exploring our garden and veggie patch. 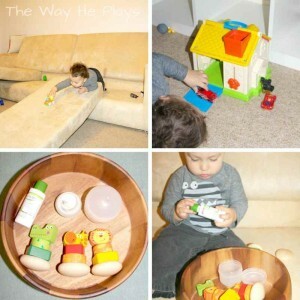 I like to give my boy new play experiences at home that are simple and engaging as he often gets bored playing with the same toys in the same way every day. We do bits of arts and crafts and lots of sensory explorations but we don’t do these every day. Most of the time we will repeatedly play with the same activities for a couple of weeks before the fun wears off. We are two weeks into this activity and he is still using it! This also lasted 2 – 3 weeks before it simply fell apart from over-use. I plan to make another one with the next cardboard box we get! We did this on a day that I was exhausted. I forced myself to get up, go outside and do something fun and am so glad I did! Not only did my boy love it but it really changed my mood and kick started my motivation to get more done later on during the day. 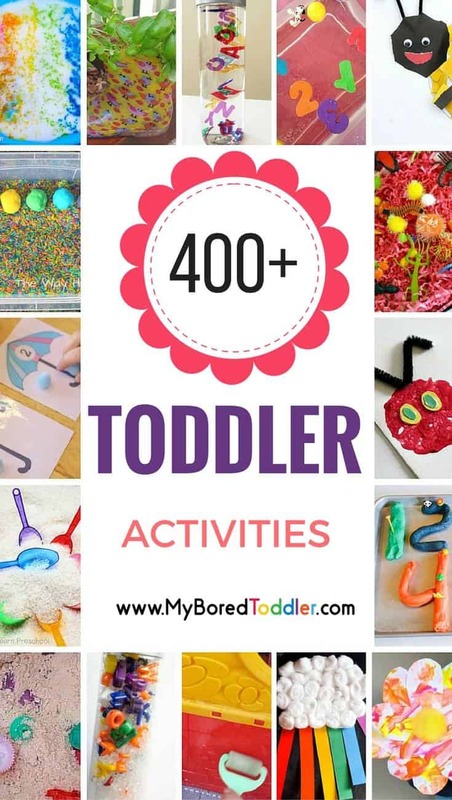 Play dough – This is such a good activity as you can make so many different types and add lots of different things to it to make it fun! 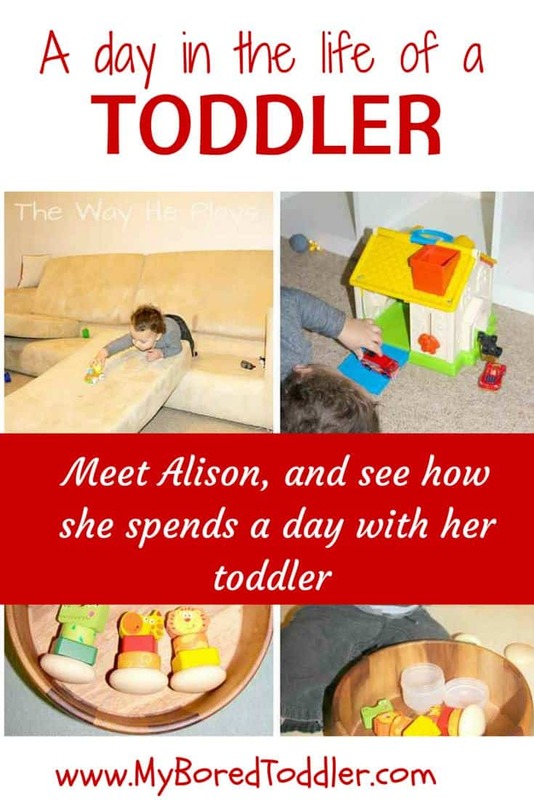 Alison is an early childhood educator turned stay at home mum who is passionate about simple, meaningful play for curious kids. 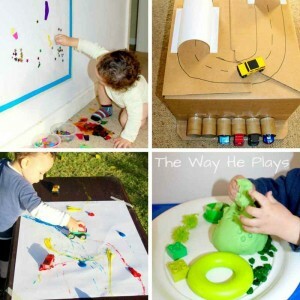 She blogs at The Way He Plays with simple ideas that you can easily do at home with your babies and toddlers. 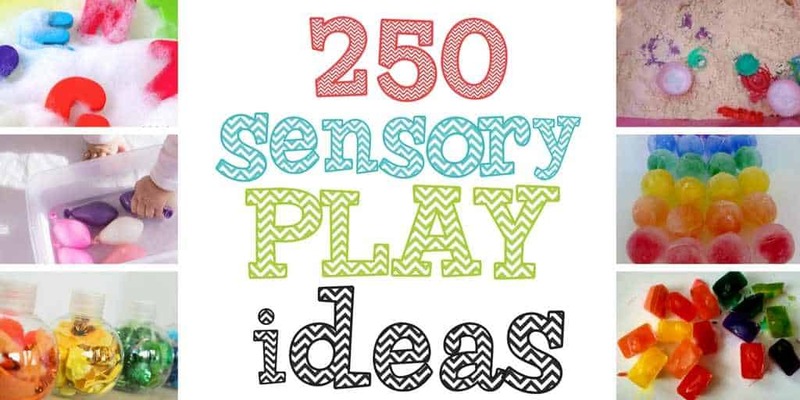 Don’t miss out on new play ideas by following her on Facebook, Pinterest and Google Plus. I love getting a peek at how others set up their schedules with families, especially little ones. My kids are 4 and 7 and we still regularly play with playdough. We love making it too! Thanks Janine. Glad you enjoyed the post. What a fun schedule! The “me time” during nap time is my favorite 🙂 I love this series! Can’t wait to read more! What a lovely idea for a post series! I really enjoyed this. That sticky wall art looks great too. Our youngest is nearly out of toddlerhood – he’ll be 3 soon! All the best for the birth of your baby.